Downey Daily will be nine years old next month. That's over 3,000 posts, nearly every day, mostly of Downey. Joan, Allison, and I started Downey Daily with the thought that it would force us to practice and improve our photography skills, with the added benefit of learning more about our city. And we have. We've learned about Downey's history, going on history walks and poking around the old Rancho Los Amigos site. We've enjoyed more yard art than I ever imagined possible. And along the way, we've met many wonderful people and made lots of new friends. Downey Daily has been our excuse to step into your lives and you've welcomed us with open arms. When Allison went back to school, her dad Steve took her place and added a new dimension by sharing your stories through Humans of Downey. And we're finally running out of ideas. Keeping up with a picture a day is getting harder and harder. 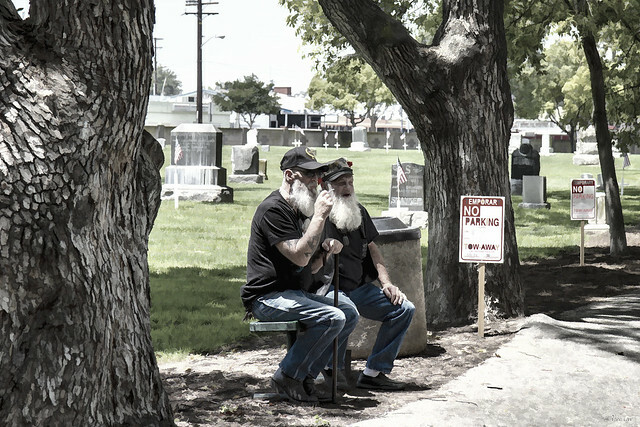 We're not ready to quit, but, like the two fellas above, we're ready to sit a while, go back to the beginning, enjoy what Downey has to offer—and some of the time, take a picture and blog about it. So, we're slowing down. We won't be posting every day anymore, but hopefully, you'll enjoy our posts more when they come. Quite a milestone. These two look like characters. Thanks, Frank and William, for your encouragement!